Alright. That was pretty easy right? 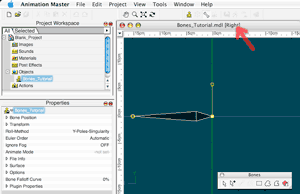 So far we have created a new empty model file within a blank project within the PWS, opened the model up in a model window, and then switched from “Modeling Mode” to “Bones Mode”. 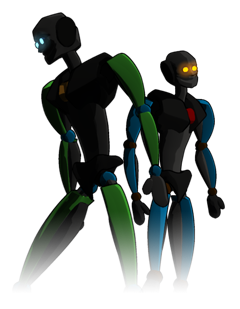 Now at this point we are looking at a blank model window in “Bones Mode”. Here is the “Default Bone”. Go ahead and click anywhere in the empty model window. You should see something like the image on the left. There is a flashing black object in the window. 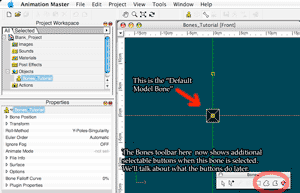 Also take note of the fact that now that the model window is active, there are some additional selectable options in the “Bones Toolbar”. The black flashing object is actually a bone. Now this particular bone we can refer to as the “Default Model Bone”. We did not add any bones to this model file so why is this one here? A:M automatically generates this bone in every model file created in the program. This bone will not be visible or selectable in the PWS. From what I can tell it’s used mostly by A:M as a means to coordinate the positioning of an object in the “Choreography Mode” of a Choreography window. This bone cannot be deleted, cannot have geometry assigned to it, cannot have its color changed, and cannot have any “Actions” or “Smart Skin”, applied to it. If you want to you can translate, scale. or rotate this bone in the model window. It’s good to know that this bone is present but I generally don’t recommend that anyone interferes with this bone very much.